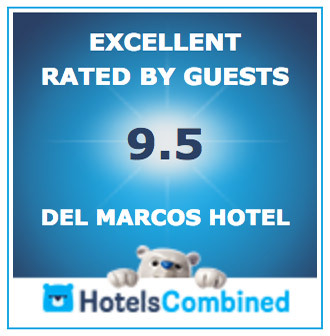 "Del Marcos Hotel is Wonderful!" I enjoyed the getaway recently to your lovely hotel. I hadn't been to Palm Springs in years and I felt like I really got away from it all! Your pool and lovely room was well received, and I know I will be coming back again soon. "Great place to stay - an oasis in the dessert"
We recently stayed at the Hotel Del Marcos and had a fantatic time. The staff were lovely and accomodating, the cruiser bikes to ride fun, breakfast yummy and lots to choose from and the pool fun, we especially enjoyed the music. We stayed in the Tony Merchel room. It is a little noisy but we still loved the hotel and will be going back next year! The staff are wonderful. There is a nice continental breakfast and staff set out a nice cheese & cracker plate one night. Fresh fruit every day in a bowl on the table forthe taking. The size of the place makes it feel like your own private spot in the sun. The location is perfect for quick walking to endless shopping and dining. The cruiser bikes are a blast! "Wish I could come back one day!" Found Del Marcos Hotel by chance and initially planned to stay one night, ended up staying three nights wishing we had time to extend the stay! The hotel is really something special; rooms, pool, happy hour, staff, design, everything is just perfect and relaxed. Calm hotel, pool and common areas due to the fact that no children under 18 are allowed. Felt like a vacation from the vacation to spend three days here! My wife and I just returned from a wonderful week at the Del Marcos, the staff is great, and the location is perfect. If your looking for a place to relax, this is the place. I stayed at the Del Marcos Hotel for three days in April 2012. The service was excellent--they went above and beyond what would be expected in order to make our stay comfortable and relaxing. The rooms are well-designed and furnished with modern appliances. The hotel is centrally-located in Palm Springs; good restaurants and shops are within walking distance. I will be back soon.